﻿Helmets required on all rides. Please remember to bring spare tube, patch kit, pump, cell phone, route map, route slip, food and sufficient water. Always let club members know at the time you decide to alter the route, extend the route or shorten the route during the ride. Always ride with a club member, never alone. Bicycling is a naturally hazardous activity because we ride on roads that cars navigate. Please be aware, be alert and always look twice before turning or passing. For great information on urban cycling safety, see here. Be careful out there! And remember, cycling is always fun! The Channel Islands Bicycle Club (CIBike) allows the use of electric bicycles that are pedal-assisted, Class 1 or Class 3 e-bikes, which meet the specifications provided below in a manner consistent with CIBike’s liability insurance and with California and Federal Law. Class 1 and Class 3 e-bikes, which are pedal assisted e-bikes (i.e., e-bikes that can only be operated by being pedaled by the rider and do not have a power-on-demand throttle), are permitted to be ridden on Club rides. Riders of Class 1 and Class 3 e-bikes must follow the rules established for e-bikes within the California Vehicle Code. (See CVC 312.5 and CVC Article 4 (commencing with Section 21200) of Chapter 1 of Division 11.) This includes following the rules of the road that apply to standard bicycles and ebikes. On any Club ride, e-bike riders shall adhere to CIBike riding guidelines and safe practices, with particular attention paid, during group or paceline riding, to riding at a speed consistent with other cyclists. Please note that all rides, unless listed as a "remote ride", start at the San Buenaventura Mission Parking Lot, located at 90 E Santa Clara St. The lot is between Main Street and Santa Clara Street next to the museum in downtown Ventura, California, off Highway 101 at California Street. Parking is FREE. 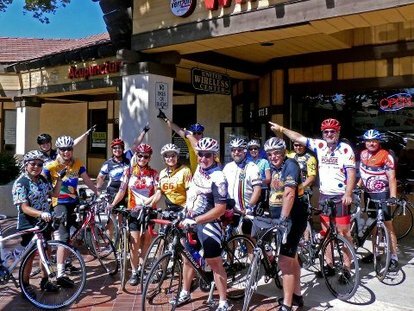 The Moorpark Bike Rides group ventures into the eastern side of Ventura County. This group is meant to be social and slower in speed as we search out a destination to refuel in the middle of the rides. Rides depart every Saturday from Moorpark and two Sundays from Camarillo. Contact Mike Stewart (mdstew48@gmail.com) for questions. Camaraderie and friendship are a main goal while at the same time providing excellent exercise and less use of our cars. We provide good bicycle rides starting in the ​North Ventura County/Ojai area. On the regular rides we take three short rest stops: one by Lake Casitas, another in Foster Park and the last at Camp Comfort. Contact Fawi Emad at femad@fpemad.com for details. On Sat. & Sun. there is a "Fast and Far" ride @ 8:00am that goes to various locations. Saturday the ride departs from the Mission Parking Lot in Ventura. While on Sunday from Holbert Park in Saticoy. You should be able to sustain 16 - 20+ mph in a group or pace line on level ground and climb. Our average ride is 40 - 60 miles and could be longer, with 2-4,000ft elevation gain. Randonneuring is non-competitive, long distance cycling. Camaraderie, not competition, is the hallmark of randonneuring. If you’re looking for more of a challenge than your local century or double century ride, please consider joining us. For most brevets, we do have a sweep vehicle. We believe we have some of the world's most scenic riding at our front wheels. We would like you to join us for a ride! The Year Rounder is a great way for you to keep track of your mileage for the year and a great way to achieve a goal for the year. You can make it as competitive or non competitive as you want. It's simple to enter, you just send me your total mileage for the month and I will add it to a spreadsheet. You might want to set a mileage goal for yourself for the year or you might want to enter our consistency challenge. For the consistence challenge all you have to do is ride a metric ride (at least 62 miles) each month. If you miss a month you can make up that month by riding 2 metric rides either the month before or after the month you miss. At the end of the year if you have ridden all the rides you will receive a small prize compliments of the club! If you would like to enter just send me an email at ridescibike@gmail.com and let me know your total mileage and whether you have ridden a metric ride for the month. I look forward to hearing from you. Happy riding, Sonia.